Blade length : 69.6cm or 27.41inches. Sori : 1.5cm or 0.59inches. Width at the Kissaki : 2cm or 0.78inches. Kasane : 0.68cm or 0.27inches. Era : Keian era Edo period. 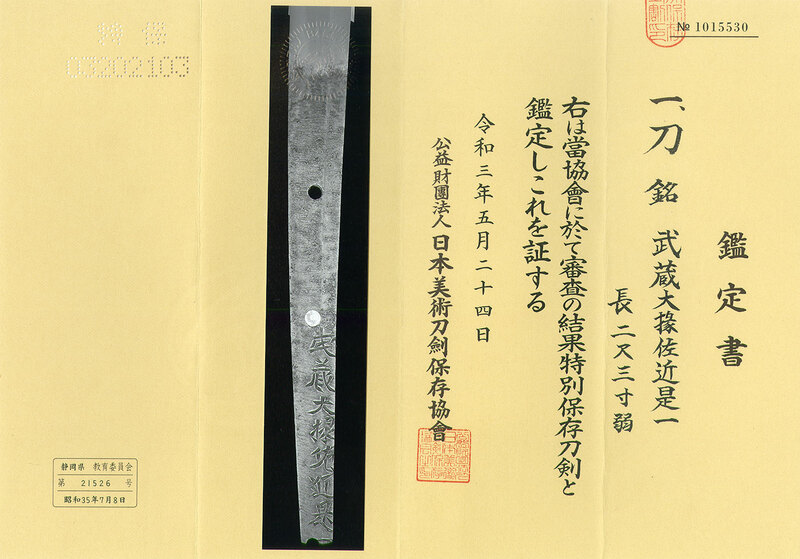 Shape : The blade is about 15cm suriage and Machiokuri nakago. Jitetsu :Itame had and mokume had well grained with clear Utsuri appear on the Ji. Hamon : From the Hamachi area, Choji midair and then suguha with komidare hamon with ashi, Yo work. Special feature : Musashi Daijyo Sakon Korekazu　１st　generation was working at Keian era early Edo period. He always making Ichimonji style active Choji midair hamon. Tsunemitsu,Korekazu and other sword makers were making Ichimonji style Jigane and hamon. is easy to understand his subject. His school continued 7th generation Korekazu(Ishido Korekazu). moved to Edo and made Ichimonji style swords. I think this sword looks like Nagamitsu utsushi. then suguha style to Kissaki area and then sansaku style boshi which style is Nagamitsu. The sword remind us Koto Ichimonji sword.